LIAM WALSH’S world-title dream ended in a third-round knockout defeat by Floyd Mayweather’s protege Gervonta Davis at the Copper Box Arena in London. The 31-year-old had waited almost five years to become a world champion since the collapse of a fight scheduled with Ricky Burns in 2012, but was simply outclassed by one of the planet’s most promising fighters. America’s Davis, 22 and from Baltimore, is a talent to the extent his promoter and mentor Mayweather insists he is capable of reaching a similar level to the one he once graced. That may prove a stretch, but the IBF super-featherweight champion is swiftly proving himself an exceptional fighter who can be expected to remain a leading figure during the coming decade if he retains his focus amid the trappings that will come his way. This was only his 18th professional fight, and the 17th he has won inside the distance. 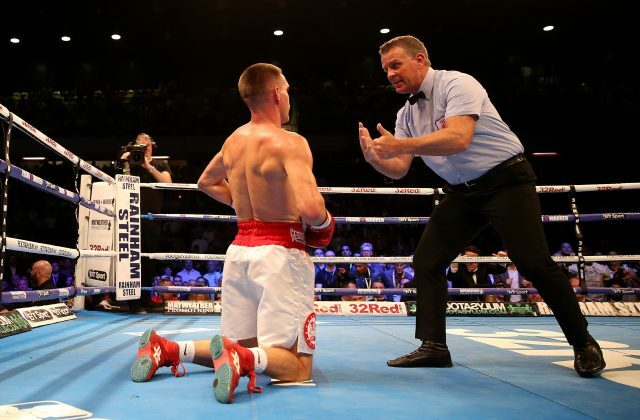 Walsh, meanwhile, is capable of recovering from his first defeat; it simply proved his misfortune to be matched against a champion of Davis’ calibre. Still young and learning. Thank you all for supporting me it means a lot! The American set an impressively high pace from the opening bell, landing with both jabs and left hands that forced Walsh to abandon his southpaw stance and switch to orthodox. If it was not already, the size of the task he faced became clear beyond doubt in the second, when the American’s consistent speed and accuracy ensured he continued to land further hurtful left hands. A particularly big left hurt Walsh in the third as he increasingly struggled to defend himself, and sensing his vulnerability Davis continued landing that same punch with increasing power until he forced the first knockdown. The challenger returned to his feet after a count of nine but remained unsteady and the fight should have been ended there and then. Davis instead resumed his hurtful assault, forcing referee Michael Alexander to intervene amid Walsh’s protests after two minutes and 11 seconds. Walsh’s twin brother Ryan had earlier won the British featherweight title outright after making his third successful defence, stopping Marco McCullough in the 11th round. There was also a third stoppage victory from three for promising heavyweight Daniel Dubois, 19, who knocked out David Howe in only 40 seconds with an explosive right hand.